An educational app that is able to capture and maintain the often fleeting attention of toddlers and preschoolers as they learn important building blocks of education. Tap And Learn ABC is a multi-faceted educational app which seeks to give young children a good foundation in learning the alphabet. The app is divided into three sections; each reinforcing a different aspect of the app’s learning flow. The first section, “Alphabets”, presents the child with a screen containing the whole alphabet. From here the child can click one of these letters to hear a voiceover pronounce the letter, and then match the letter to a randomly selected object, for example, “A for ambulance”. This is then accompanied by an animated image and a sound effect to engage the user and help them create a mental link between the letter and the object. From this screen the child can move on to the next letter, go back a letter or tap the screen to hear an alternative object for that letter. The second section, “Puzzle”, follows on from the first section by testing the child’s mental link between letters and objects. This test is a series of multiple choice questions where the child is presented with a letter and told to tap the image of the object associated with the object. 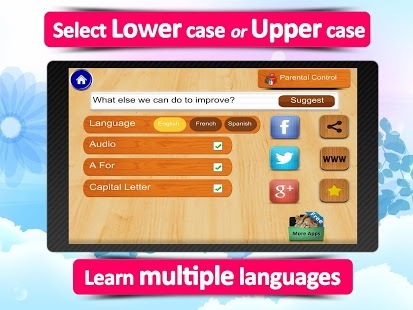 There are three difficulty settings to choose from, beginner, intermediate and expert, which affect the number of choices given per question. The quiz begins with A and moves through the alphabet, but particularly troublesome letters can be skipped to with a handy alphabet line at the bottom of the screen. If the child gets a question wrong, the app is gentle, letting the child know that was the wrong choice, but suggesting they try again. In a similar manner, when the right answer is chosen, the app gives a randomly chosen phrase of encouragement. The third and final section, “Ninja”, is less formal and more focused on matching the child’s association between images and the objects they represent. These images are thrown onto the screen at random, and the child has 90 seconds to slice the objects with their finger as the announcer calls them out. This section is a clever use of the device’s touch screen capabilities, but unfortunately the slicing doesn’t feel quite accurate enough and could perhaps use a screen before the game explaining the rules and aims of the game, as I wasted my first round trying to figure out exactly what I was doing. On the whole, I felt this app was quite fun and effective. There’s a good range of content, the voiceover is a human voice and provides useful information and instructions on how to use the app in the first two sections, as well as on the main menu. The use of images, animations and sounds to reinforce the word associations is a really good idea; though I feel better quality images and sounds would have really helped this app shine. 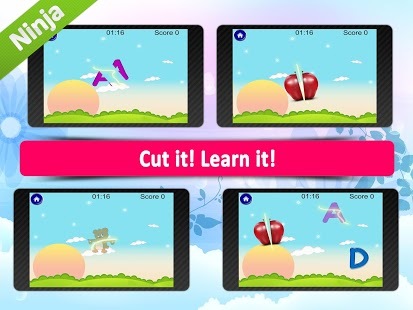 The randomisation in content helps the replay value of the app, as children won’t get too used to the flow of the app, and the use of a scoring system in the Ninja mode can help engage the child and push them to do better. It would be really useful to have a system built on top of this to track the child’s scores over time. To summarise, Tap and Learn ABC is good at what it does. It’s quite engaging, quite fun and hits its target well with the younger child demographic, but falls just short of great. With a little more polish, a little more quality in content and some expansion on their existing ideas, this app could be one step closer to greatness. 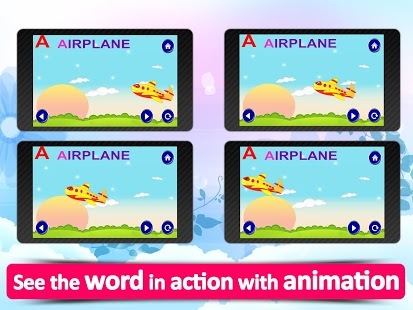 Tap n learn ABC with animation and sound. Finally! An educational app that is able to capture and maintain the often fleeting attention of toddlers and preschoolers as they learn important building blocks of education "The alphabets." App from company that has >5 million users worldwide. * Fun introduction to the English alphabet! * Realistic visual and audio aids to demonstrate the use and sound of each letter! * Easy for toddlers and preschoolers to play alone or with parents to play along! * Supports both capital and small letters. Start the Tap and Learn ABC app. Tap on any letter on the vibrantly colored screen. A screen appears with the selected letter, an image of an object, and the word that represents the object. Tap the audio button to hear a human voice pronounce the letter and the word. That’s it! 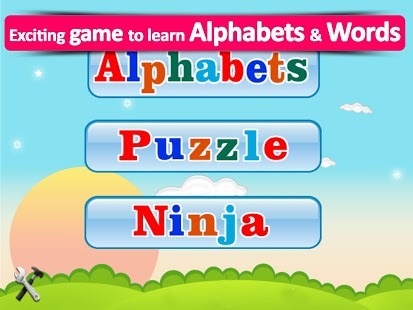 Three simple steps and your young child is on their way to learning the alphabets! * Familiarize alphabets in a fun way. * Dozens of sounds and voice recordings of items, colors, letter, fruit names. * Best for pre-school and nursery children. * Multiple words with each letter with real picture and sound effects where applicable. *Human Voice Audio* – Each letter of the alphabet is spoken in a human voice so a child can clearly understand how it should be spoken. The child can press the audio button several times to practice alongside the audio. *Multiple Language Support* - The human voice that speaks each letter of the alphabet is available in three languages: English, French, and Spanish. 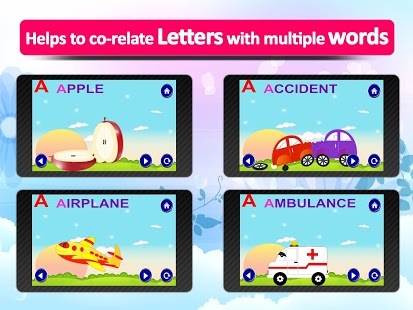 *Visual and Audio Effects* - To enhance your child’s learning, each letter is featured alongside an image of an object that is in everyday life that is represented by a word that starts with the highlighted letter. Each image features a real-life animation to depict the represented item in its natural environment! *User-Friendly Interface* - The interface for the Tap and Learn ABC app is so simple that toddlers can easily learn to tap the screen to progress through the letters of the alphabet. Each screen includes back and forward buttons that you can use to navigate through the screens. 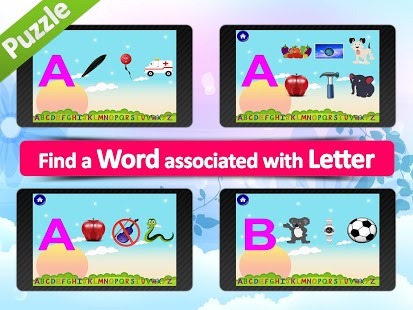 *Upgrade Option* - The free version of the app features letters A-E of the alphabet. This gives you an opportunity to try out the app. Once you discover how great the app is for teaching the ABCs and how much your toddler enjoys it, you can use the easy upgrade option to obtain the full set of the alphabet. The Tap and Learn ABC app is a great companion for toddlers. Download the app today and start your child on a wonderful path of learning!